I was a huge fan of the old TV series, The Pretender, starring Michael T. Weiss. It was, I felt, a refreshing concept – on top of the old, familiar theme of the Imposter, one who “becomes” whatever he chooses to be and operates well enough to fool others, you have the theme of an adult male encountering the real world for the first time – childlishly delighted to discover the Three Stooges, or aerosol cheese, or Pez candy. The character of Jarod, a genius combining superior intelligence with naivety, was an invitation to us all to stop and appreciate the wonders that surround us. His quest to find his mother, from whom he’d been kidnapped by the sinister “Centre,” where he was raised as a guinea pig, reminded us of the importance of family. But the show wasn’t well served by its production team. Each season, Jarod would discover a chain of clues leading to his true identity, and would follow them up, and then the next season that chain would be completely abandoned for another, frustrating the fans. The scripts began to lose track of the original series concept. The show died. There was an attempt to revive it on the TNT network, but that plot was another pointless detour, with uncalled-for mystical accretions. 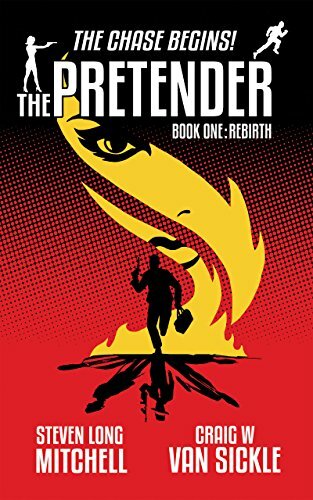 So I was interested to see that the show’s original creators, Steven Long Mitchell and Craig W. Van Sickle, had come out with a couple new Pretender books. The first is The Pretender: Rebirth. I read it with considerable enjoyment, though it’s flawed. As in the TV version, Jarod, the Pretender, has escaped the Centre. Jarod is a rare genius, a young man with quick learning and empathy skills that allow him to “become” anything he chooses to be, with just a little research. Pursuing him are Miss Parker, sort of like Diana Rigg’s Emma Peel with a harder edge, and Sydney, the scientist who monitored Jarod through childhood, helped him develop his gifts, and became his father-figure.